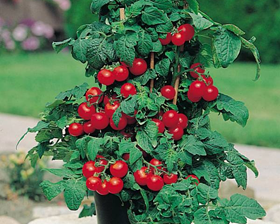 Invite these petite plants onto your patio and get ready to enjoy a bountiful supply of the tastiest little tomatoes ever. The 30-40cm plants fruit mightily—producing as many 3-5cm fruits as plants twice their size. 'Balcony Wonder is just the right size for small pots, and a large tub can fit 2-3 plants. Height: 30-40cm.